Indonesia has geographical conditions which are very vulnerable to climate change. The waters of Indonesia cover two-thirds of its territory. Moreover, Indonesia has 17,000 islands which most of them are small islands, 60 percent of the population lives at the coast, and 80 percent of natural disaster happens in Indonesia related to climate change. Therefore, Indonesia still commits to contributing in the global act to reduce the emission. “Indonesia commits to reducing emission by 29 percent below business as usual in 2030 and 41 percent with international cooperation,” President Joko “Jokowi” Widodo said when delivering a statement on the Leader Statement Event of the UN Framework Convention on Climate Change (UNFCCC), Conference of Parties (COP) 21, at the Loire area Parc des Expositions du Bourget, Paris, France, on Monday (30/11) afternoon local time. 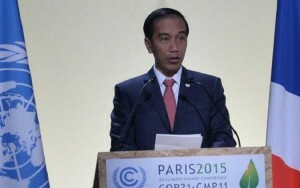 The emission reduction, according to President Jokowi, will be performed in several sectors. In energy sector, the budget to subsidize fuel oil will be diversed to productive sectors. Furthermore, the use of renewable energy will be increased by 23 percent of the national energy consumption in 2025, and the waste will be processed into energy resources. On forest and land management sectors, the President added, the act to reduce emission will be taken by: implementing one map policy, stipulating moratorium and review on peatland usage permit, as well as managing land and forest sustainable products. Meanwhile, on maritime sector, the Government will solve the problem of illegal fishing/IUU Fishing and to preserve sea biodiversity. “These efforts are involving all people, including indigenous peoples,” President Jokowi said. President Jokowi who delivered the statement in Bahasa Indonesia said that Indonesia, as one of the countries with the largest forest area in the world and referred as “the lungs of the world”, came to Paris to be part of the solution. “As one of the countries with the largest forest area in the world and referred as “the lungs of the world”, Indonesia has chosen to be part of the solution. The Government that I lead will develop the country by caring the environment,” President Jokowi firmly said. The President also said that recently Indonesia is facing forest and peatland fires. Furthermore, the hot and dry El Nino has made the fire management effort extremely difficult. However, President Jokowi is grateful because the situation has been overcome. According to President Jokowi, law enforcement must be taken firmly. Preventive measures have been prepared and ready to be implemented, including to restore peatland ecosystem by establishing Peatland Restoration Agency. On that occasion, President Jokowi also wished for the agreement to be achieved in the Summit in Paris to reflect the balance, justice, and in line with national priority and capability. “(The agreement) may be bind, long-term, and ambitious, but not obstruct the development of developing countries,” President Jokowi said. The President mentioned, in order to reach an agreement in Paris Summit, all parties, particularly the developed countries, must contribute more on mitigation and adaptation acts, by implementing: mobilization US$ 100 billion of funding until 2020 and the amount shall be increased in the following years, eco-friendly technology transfer, and capacity building.